Tumor necrosis factor alpha-induced protein 3 (TNFAIP3, A20) is a negative regulator of the nuclear factor-κB (NF-κB) pathway. 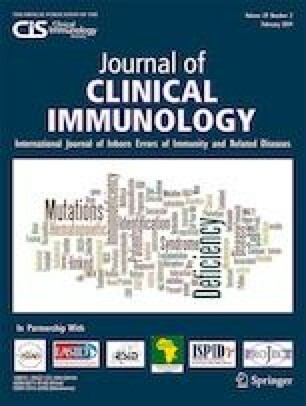 It has recently been recognized that TNFAIP3 deficiency leads to early onset of autoinflammatory and autoimmune syndrome resembling Behçet’s disease. Here, we report a novel mutation in TNFAIP3 in a Chinese patient, who had Behçet-like phenotype and persistent Epstein-Barr virus (EBV) viremia. The clinical data were collected. Immunological function was detected. Gene mutation was detected by whole-exome sequencing (WES) and confirmed by Sanger sequencing. mRNA and protein levels were detected in the patient under lipopolysaccharide (LPS) stimulation by real-time PCR and Western blot. The patient is a 13-year-old boy, presenting with intermittent fever for 5 months, who also experienced diffuse lymphadenopathy, arthritis, and recurrent multiple gastrointestinal ulcers. EBV DNA was detected in the serum and peripheral blood mononuclear cells of the patient. The immunological phenotype showed increased proportion of double-negative T cells (CD3+CD4−CD8−). A novel missense mutation (c.1428G > A) locating at the zinc fingers 2 (ZF2) domain of TNFAIP3 inherited from his mother was confirmed. Compared with age-matched healthy controls, decrease expression of A20 was observed in the patient. The NF-κB pathway was found to be overactivated, and the synthesis of TNF-α was upregulated in the patient-derived cells. However, cells from the mother showed a milder response to LPS than cells from the patient. The present research indicated that the TNFAIP3 mutation of c.1428G > A (p.M476I) leads to the reduced suppression of NF-κB activation and accounted for the autoinflammatory phenotype and persistent EBV viremia in the patient. Xiaolong Dong and Luyao Liu contributed equally to this work. This study was supported by the National Natural Science Foundation of China (81471482), the Science and Technology Commission of Shanghai Municipality (14411965400), the Shanghai Hospital Development Center (SHDC12016228), and Children’s Hospital of Fudan University Funding (EK1125180110, EK112520180202). Many thanks to the patient and his parents. Duncan CJA, Dinnigan E, Theobald R, Grainger A, Skelton AJ, Hussain R, et al. Early-onset autoimmune disease due to a heterozygous loss-of-function mutation in TNFAIP3 (A20). Ann Rheum Dis. 2017. https://doi.org/10.1136/annrheumdis-2016-210944.